The All-New Traxxas Spartan™ Brushless Muscleboat! Spartan is fully assembled with a TQi™ 2.4GHz radio system, Velineon brushless power system, applied graphics, and detailed instructions. Two Traxxas Power Cell 7-cell NiMH batteries are also included. Designed specifically for the high-power needs of the Velineon brushless system, the potent Power Cell packs feature heavy-duty construction, 12-gauge wires and patented Traxxas' High-Current Connectors for efficient power transfer, run after run. Traxxas backs the Spartan and all of our products with industry-leading support that is second to none. A staff of skilled representatives is on-hand to answer your questions via phone, website, or e-mail. Unmatched parts support allows Spartan to be serviced with parts and support from thousands of hobby dealers worldwide. Your investment is also protected by the Traxxas Lifetime Electronics Warranty. Traxxas goes the extra mile to ensure that your R/C experience is easy and fun—and fast! The TQi's most important new feature may already be in your pocket. The TQi can be equipped with an optional Docking Base (#6510) that turns your iPhone® or iPod touch® (sold separately) into a powerful tuning tool for your Traxxas model. The full-color display combines with the free Traxxas Link™ App (on the App Store) to deliver an intuitive, high-definition, full-color graphical user interface that unlocks the mysteries of optimizing your radio system for ultimate vehicle control. Traxxas Link also opens the door to telemetry capability when you add optional sensors to your model. 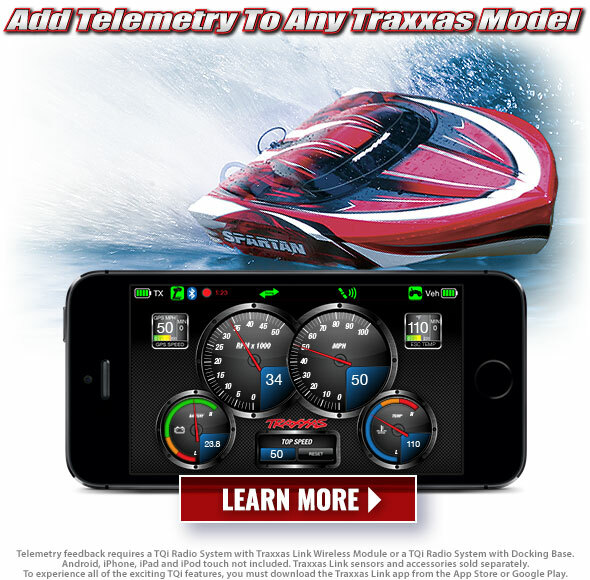 Click on one of the following links to learn more about the ground-breaking TQi radio system, TQi Docking Base, and the Traxxas Link Application.